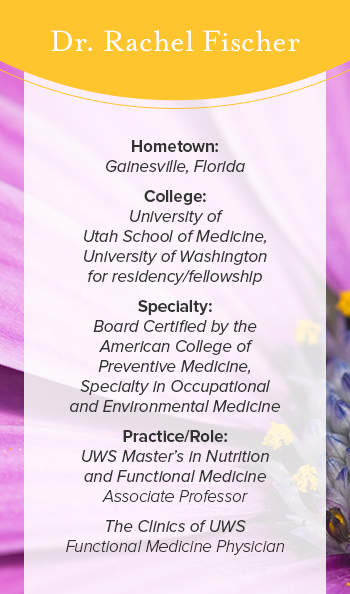 Rachel Fischer, MD, MPH, is a physician and faculty member in the college of graduate and professional studies at the University of Western States (UWS). Her research interests have gravitated toward preventive medicine and optimal health and performance. She is board certified by the American Board of Preventive Medicine and is currently pursuing certification by the Institute of Functional Medicine. Question: Have you always been interested in public health? Dr. Fischer: I was a journalism major in undergrad, and did corporate communications for Blue Cross and Blue Shield of Georgia. I was in the marketing department, where I got involved in public health issues concerning access to health insurance and medical care. This sparked my interest in public health. I knew nothing about it until then, but it motivated me to pursue a master’s in public health. After I got my MPH degree, I joined the Peace Corps. It was there where I started developing that burning passion for wanting to help the individual. Originally, I had planned to return to graduate school for a PhD in epidemiology. However, when I got back from the Peace Corps, I thought, you know, in eight years, I could complete premed and medical school. So I made a plan, and that's what I did. The whole time it was really with this passion for public health and prevention. What was the largest challenge you faced after graduating? Starting out in medical school, before even becoming a doctor, you feel like you have so much power and knowledge. I think it's an ego thing. Once I got onto the patient wards and started treating patients, I realized, ‘Wow, prevention really is needed.’ It's amazing how sick people are. We were taught the tools to judiciously and effectively provide the right medicine at the right time -- and I think that’s really important. However, as physicians we did not step back and go...wait a minute, why did this disease, particularly chronic disease, happen in the first place? What is it like being a MD in a chiropractic environment? There was a lot of fear when I decided to leave a typical medical practice and join an integrative practice with chiropractors and massage therapists. That being said, once I got here, I realized UWS is a pretty amazing institution with leaders who understand that something needs to be done - at a fundamental level - to help people actually achieve health and not just manage chronic disease. My colleagues are chiropractors and naturopaths, and I'm a MD. Much of our training overlaps, but is very different. If they have a medical question that I'd be more familiar with, they can say, "what do you know about this and that?" And vice versa. It’s pretty amazing to have that acceptance and sharing in knowledge to help each other. The patients are truly the ones who benefit from that. In your own words, what is integrative medicine? Integrative medicine is "root-cause" medicine. In my previous world as a medical doctor, I would say, "Well the root cause of chronic disease is lack of exercise and not eating right. Okay. Well addressing lifestyle helps, but the real gold is in getting the patient to understand why it is happening. I find this motivates patients to invest more in their own treatment. Integrative medicine is about functioning optimally, and we look at that in a lot of different ways. We are looking at communication in the body. How do the mental, spiritual, and emotional aspects of their lives intertwine? Every visit those things are addressed. What’s a typical visit look like for a patient of integrative medicine? For the most part, patients are really surprised when they sit down with me because of how much time I spend, and the questions I ask. Patients appreciate the experience, once they understand what the visit is going to be like. There is a fear among physicians that if you let a patient talk, they'll never stop. And that's just not true. Once they tell their story and get it out, it creates an amazing relationship of trust, and you really understand what is going on inside the patient. It ends up not taking up that much time. But it's vitally important. What’s next for the future of healthcare? We have to change the way we practice medicine. It's not good enough anymore to just diagnose and give a pill. And for the chiropractor, they already understand, it's not enough to diagnose and do an adjustment. It's about getting to the root cause about why things happen. My hope is that as healthcare evolves, people accept daily responsibility for their whole-body health. In the long run, hopefully this saves thousands, if not millions, of people from getting chronic disease later in life. Personal Insights is a series of profiles on the people and institutions leading the movement forward, breaking down the barriers between integrative care and everyone who needs it. Integrative Therapeutics is committed to supporting initiatives like residency programs, universities, and clinics, because we believe everyone deserves options to choose their ideal path to health and happiness.